This semester I wanted to explore the the creation of an experience around a musical artist. My initial interest was in the experience of a live show, but I ended up exploring many different avenues in my process which resulted in a lot of research and concept work that will affect what I do post-graduation. As well as exploring/creating content for myself as an artist, I was also able to work on content for another local Columbus music group called "Truslow." Early in the semester I worked on a project with a local band called Truslow. The singer of the band, James Truslow, first approached me about doing an introduction video for their upcoming EP. This included a sort of monologue describing who the band was and what the EP was about with accompanying B-roll. The band ended up deciding not to release the video, but because they really liked my work on it, they kept asking me for help in creating content for them. As a band trying to expand your fanbase online, it is very important to post engaging content as consistently as possible. Facebook is programmed in such a way that the more often you post and the more people that engage with those posts, the more often your posts will show up in your fans’ newsfeed organically (without paid promotion, also known as sponsorship). The same goes for YouTube: the more views/attention that your videos are getting, the more likely they are to show up the suggested video areas of other popular videos. Because I have my own YouTube channel and an interest in music promotion and fan engagement, I was able to bring some new information and perspective to the band’s strategy. The biggest parts of the project were the lyric videos I was asked to make. At first, James said he just wanted something simple because they couldn’t afford the cost of something more interesting that would be time-consuming for me, but I knew that would be a lost opportunity for us both. I wanted to create content that would not only challenge me and provide me with portfolio material, but that would also provide the band with more engaging content. It was worth sacrificing my deserved fees for these things. Creating more dynamic lyric videos draws more viewers than a simple lyric video. James’ goal was just to have the songs available on YouTube, but with that kind of video, you aren’t drawing views from your existing fanbase that already own the songs, and the video isn’t really “shareable”. With a more exciting approach, existing fans are more likely to watch/rewatch and people are more likely to share the video on their social networks. Three of the videos were motion design, which were great for developing my AfterEffects skills and filling out the motion design section of my portfolio. One of them utilized a live video I had shot for the band that had previously been shelved. As a standalone video, it wasn’t that interesting, but it worked well as a lyric video. My standing relationship with the band helped a lot at this point since I had already shot several of their shows. I took a completely different approach to the last video, as the pace of the song did not call for the high-energy motion graphics of the others. This one was compiled of live video of handwritten lyric cards, inspired by the growing popularity of physical lyric videos from artists like Katy Perry. My original deadline for these videos was rather open-ended, but we were going to start releasing them once a week as I began wrapping them up. That deadline, however, was expedited when the band got put on the bill for a huge show. About a week beforehand, James let me know that they would be opening for Twenty One Pilots (a previously local band with a now worldwide following) at one of their two sold-out hometown shows, and they needed the music up on YouTube by that time. It was a massive amount of work, but I got them all done in time. They received great feedback from the fans and are continuing to get a great amount of views. As I mentioned earlier, I also created an "EP Introduction" for the band that remains unreleased. I'm including it here because I am very proud of it, and it is why the band ended up hiring me to do the lyric videos. While it ended up not being something they wanted to use, I think it is a great piece that shows the type of great content I can produce for bands. In addition to YouTube, social media platforms are also extremely important for bands to engage with their fans and release content. Instagram provides both an opportunity and a challenge for producing video content as it is on such a small screen and is only 15 seconds. I had the amazing chance to shoot Truslow's set when they opened for Twenty One Pilots' big hometown show, and this is the Instagram video that resulted. Over the past few years, I began attending arena tour concerts and was absolutely blown away by the high production value. Many of these tours have incredible lighting, set, video, and motion design that supplement the performance, changing the concert into an experience. Some of the artists I saw included Maroon 5, Taylor Swift, Justin Bieber, One Direction, and Lorde. Something that bothered me, however, was the incredibly high ceiling on this type of production. You don't really see level of this type of supplemental content unless you are in an arena, because not many people have figured out ways to include this kind of content on lower budgets. Every once in a while I would go see a smaller band like Hellogoodbye or Owl City and see that they were including video projections and artful lighting even in small venues, and it really inspired me not only to explore creating this content for my personal music and concerts, but also to figure out how to help other smaller artists bring their performances to the next level in this way. Much of this semester was a researching, conceptualizing, and planning phase. Eventually, I want to create projection content for all my original songs that will supplement my live performances. 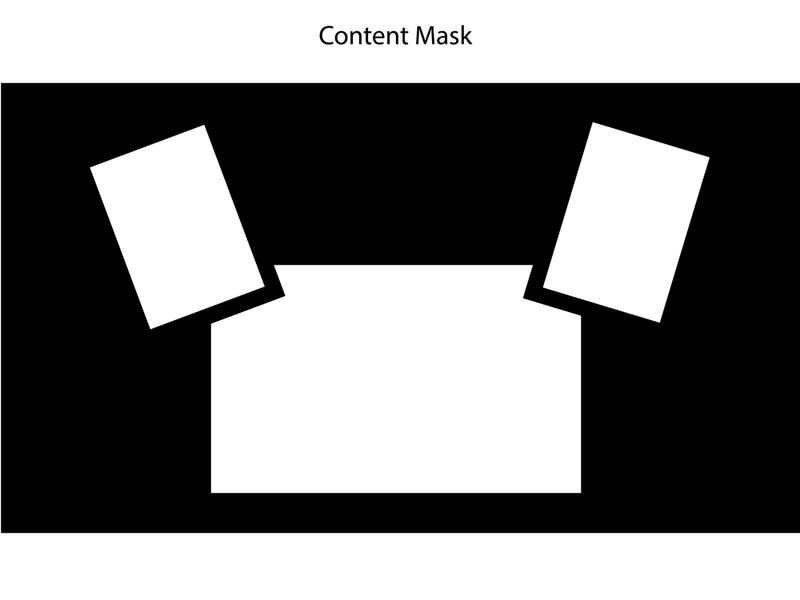 I have purchased the frames that will house the projection screens, and the following diagrams show 1) how the stage will be set up and 2) the layout/mask for the video content I will create. This mask will allow me to utilize a single projector to display content on the 3 screen shape I have designed. A next phase in research is finding an affordable front projector that has a short enough throw for the various small venues I will be playing. I have been in the studio tracking my first EP. I hope to release it in the spring. When the songs are all ready, that is when I can begin to design the lyric videos and projection content for each of them. Scheduling conflicts with my producer were a huge reason for the delays in this content creation, but I plan to move forward with all of it post-graduation. This is a rough edit of my first lyric video for the EP. The song still needs to be mixed, and some color correction and polishing need to be done to the video. In an effort to gear my required fine arts class towards my thesis (and career goals), part of this project counted towards my screenprinting class, because all of the lyrics were physically screenprinted onto the board games by me. In exploring the idea of fan engagement and artist experiences, I also created screenprints that I plan on selling as merchandise at my shows. Fans value art that is related to musicians that they enjoy, especially if the artist created it with their own hands. I am currently interning with a local production company called "Elevate Pictures". I was hired not only for my shooting/editing skills, but specifically for my interest and experience with YouTube as a platform. I am helping with content creation and channel management for the CD 102.5 YouTube channel. Though unpaid, this internship is going to be very helpful in the development of my personal YouTube brand. I have plans to continue to release the mashup videos that have grown my subscriber base in addition to introduce more of my original content.